So once I got the sides glued up on the new cart, I went on to the front and back section which was pretty easy. 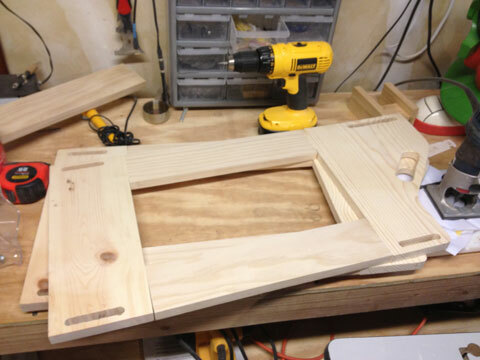 I took the old frame and used the position on the front and back bars to mark on the wood pieces where the tenon spots would go, drilled them out, and then used the router table to clean up the slots. What I did was set the fence so that the bit was inside the hole I drilled and right on the outside of it. So when I ran the piece down the bit, it cleaned up all the lines from each of the drill holes and evened it all up. I put two support braces in the middle, as you can see. 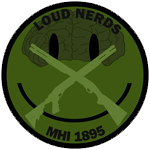 One would have been sufficient, but since there is a certain amendment that I am partial to I am sure you can see what I did there. 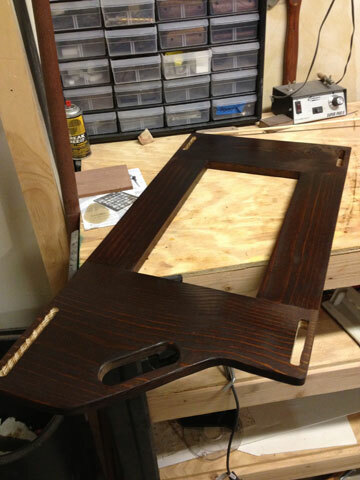 After that was done, I went ahead and began pre-finishing the wood since it is easier while everything is in pieces. Once the stain had set for a bit, I rubbed it down to take off the excess and let it dry. Now all four sections are sitting in the garage waiting for a few coats of poly finish and then a good finishing rub with some steel wool and wax to give it a nice satin finish. More pictures to come. Should have it finished in a week or so, all depends on how the varnishing looks. We got this laundry cart thing about a year or two ago. 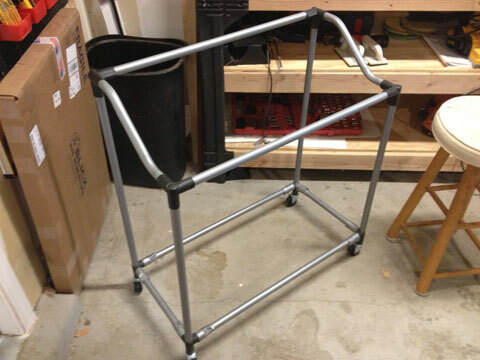 It’s got an aluminum and plastic frame that holds three bags so you can sort your laundry in it. The problem with it is that the plastic pieces that make the corners on it are pretty much crap. They have all cracked and the thing will come apart if you look at it the wrong way. The wife has been wanting to replace it for a while but I’ve been fighting against it because why buy a replacement when it will do the same thing as the original one and break. Instead I decided that since she wanted it replaced and I have tools I would just make a new one. So this is the original frame, now deposited in the garage because it has reached the stage where it is unusable except as a way for me to get measurements for the replacement. The only parts on this that might be kept are the wheels. I can use them on the new frame and all I will have to do is drill holes on the bottom of the frame for them to fit into. So, with absolutely no pattern, no plan and no real vision for what I wanted when it was done (besides a replacement for this thing that was about the same size and shape but wouldn’t fall apart) I got to work. 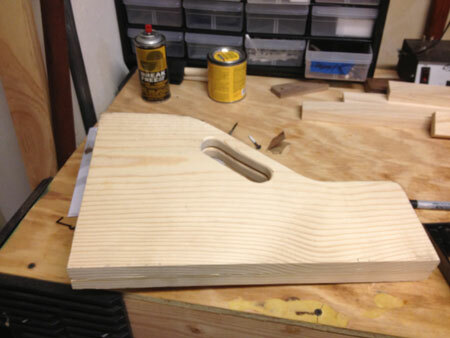 First idea was to have the sides made out of one solid piece of wood. A solid side piece would be much easier, more stable and take less time. Only problem was after a visit to my big box store I realized they didn’t have a section of wood wide enough to fit the bill. Yes, I could have gone to a lumber supply place but I was trying to keep the costs down and use what was available and inexpensive. So, with doing a single slab out, I decided to make a top piece with two wide front and back support rails and a thick bottom piece for the sides. So here is the top rail after I cut it out. I added a hand hold into it since it’s a pretty thick slab of wood to make it easier to pull wherever she wants it. Once I had both of them roughed out I clamped them together and put them on the belt and spindle sanders to make sure all the edges were even and lined up. 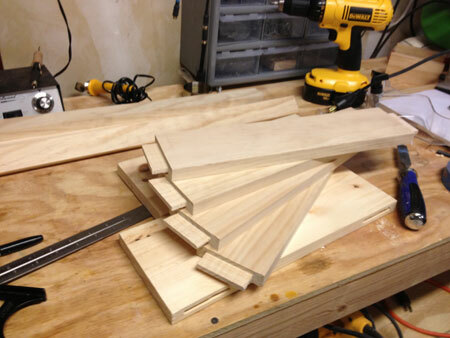 After all that was finished I cut the side supports out of some 1″x4″s that I picked up. Yes, those are Mortise and Tenon joints. I decided that even though I had never used them before this was the perfect time to try it out. 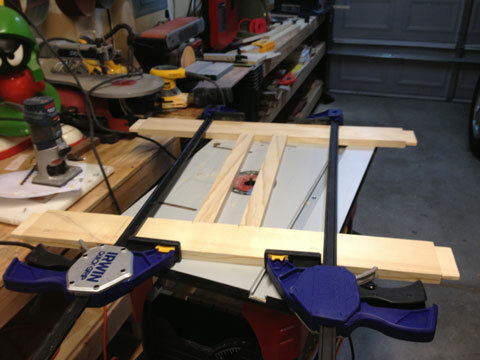 I had picked up a set of Dado blades while I was at the store and figured if I screwed it up, it wasn’t on something that would be a major problem and if it worked – new skill set! Once everything was cut out I simply glued and clamped it all together and left it to dry overnight and then sanded them the next day. There are a few small problems with the fit. A few of the cuts weren’t perfectly square, so it shows in the joints but overall they are tight and strong which is the real goal anyway. Would I like them to look perfect? Sure, but I can’t really gripe since this is my first try. This is where I will stop for today. Got a lot of work done and there is a lot more to do including staining, sealing and varnishing but that’s in the future. The long slots that are cut in the panels are the through mortise for the top and bottom rails, I’ll post about those tomorrow. *Actually, she only mentioned this once and I decided to do it because I knew it would make her happy.